Berlin, Germany. Old Jewish Cemetery at Grosse Hamburger Str. with memorial sculpture installed in 1987. Photo: Samuel D. Gruber (2016). Berlin, Germany. Old Jewish Cemetery at Grosse Hamburger Str. 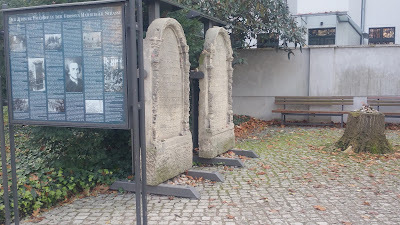 Preserved gravestones and historical signage in German, English and Hebrew in side entrance. Photo: Samuel D. Gruber (2016). Berlin, Germany. Old Jewish Cemetery at Grosse Hamburger Str. Photo: Samuel D. Gruber (2016). 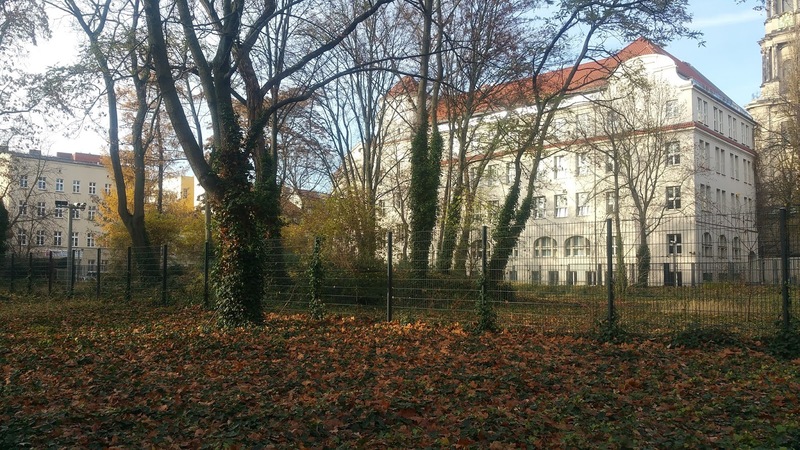 Even as many Jewish institutions flourish today, Berlin is a city steeped in Jewish memory. So much of the city's Jewish history and culture was truncated, and tens of thousands of the city's Jews were forced into exile or to death under the Nazi regime, that it is hard to conceive how the Jewish present can ever again eclipse the Jewish past. Through of the city there are scores of memorial plaques and stones, museums, and commemorative sites; and there are cemeteries. The largest of these is the last opened, the 43-hectare Weissensee Cemetery. 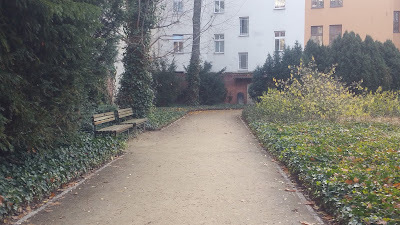 But the oldest is the small and extremely poignant Old Jewish Cemetery on Grosse Hamburger Str. in the dense urban are of Mitte, once an neighborhood also filled with living Jews and vibrant institutions. Today it is a peaceful and respected urban oasis, but it took decades to reach this solution. 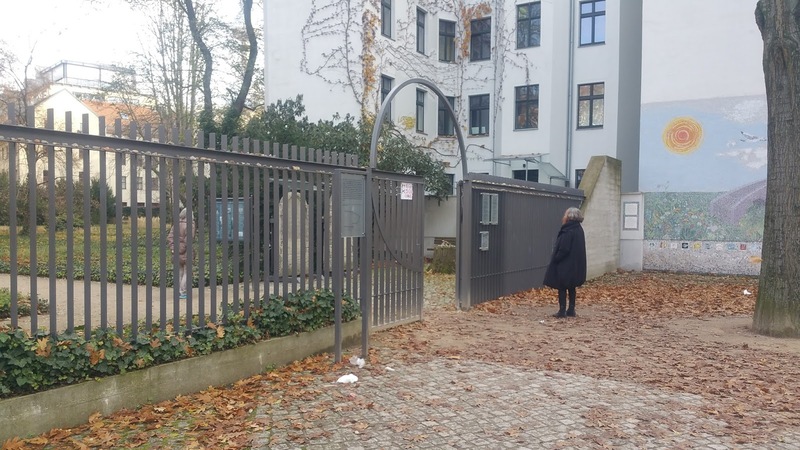 This was the first home of the Jewish Community of Berlin. In 1942, the Gestapo turned it into a collection point for Jewish residents. 55,000 Berlin Jews, from infant to the elderly, were dragged to Auschwitz and Theresienstadt concentration camps and bestially murdered. Do not forget. Resist war. Embrace peace. Berlin, Germany. Grosse Hamburger Str. 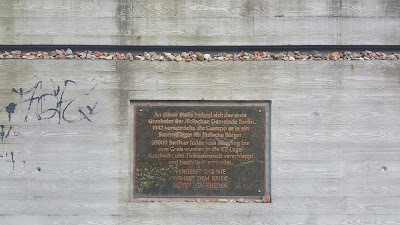 Memorial plaque for Berlin's deported Jews. Note the commemorative stones set on a sill within the concrete wall. Photo: Samuel D. Gruber 2016. The cemetery was founded by the so-called “Schutzjuden" (Jews with special protection from the state) who had come from Vienna in 1671 and been allowed to settle in the Spandauer Tor area, not far from the cemetery, which was in use between 1672 and 1827. Besides members of Berlin’s Jewish community, Jews from Spandau, Nauen, Kremmen, Zehdenick and Oranienburg were also buried here. Berlin, Germany. 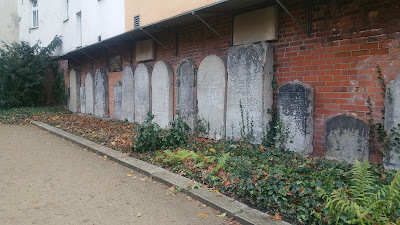 Old Jewish Cemetery on Gross Hamburger Str. before destruction. Photo: Centrum Judaicum. Berlin, Germany. Old Jewish Cemetery on Grosse Hamburger Str., present state. Photo: Samuel D. Gruber 2016. 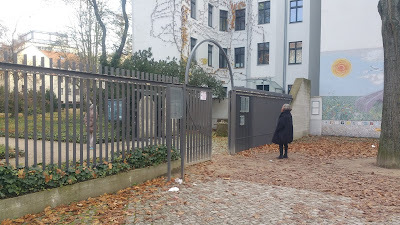 Unlike the the large Jewish cemeteries on the periphery of Berlin's urban core which for complex reasons survived the Nazi regime and Shoah substantially intact, the old cemetery on Grosse Hamburger Str. was completely devastated by the Nazis when in 1943 the grounds were used for air raid shelters and gravestones were used to reinforced the walls. 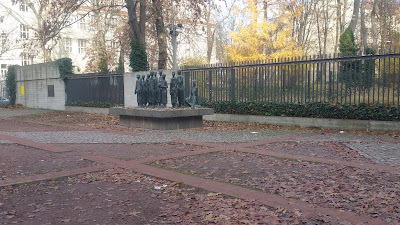 Then in April 1945, the area was the site of mass graves for soldiers and civilians killed during Allied air raids. An undated stone plaque, perhaps from the 1960s, is attached to a far wall of the cemetery and commentaries these burials - though not the fate of the city's Jews. 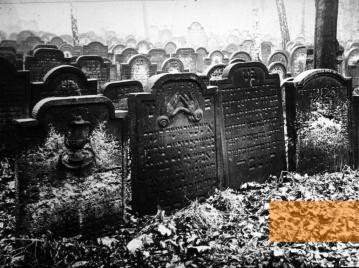 The exact number of Jews buried in the cemetery from the 17th through the 19th century is unknown, with estimates as high as 12,000. An inventory at the times of the cemetery closing in 1827 identified 2,767 graves. Today, no gravestones remain in situ, and only 19 gravestones are preserved at all - set against the cemetery's interior southern wall. In addition to Jewish burials there are 16 mass graves on the site for the non-Jewish air-raid victims and soldiers. These and earlier diggings on the site for shelters disturbed hundreds, if not thousands, or earlier Jewish burials. 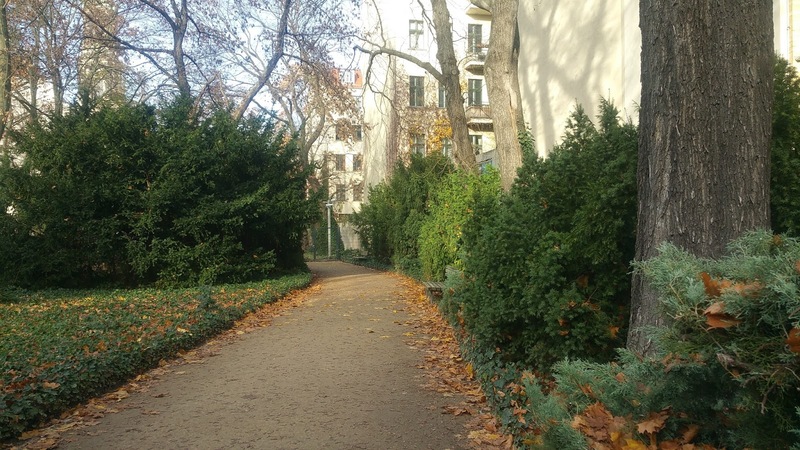 In 1948, a plaque commemorating of the cemetery's history was erected by the Jewish community and during the GDR era, the cemetery was declared a park complex under monumental protection. In the 1970s, East Berlin’s Department of Parks and Gardens removed the remaining Jewish gravestones as well as the wooden crosses marking the graves of air raid victims. Then the cemetery was used as a park. Berlin, Germany. Old Jewish Cemetery at Grosse Hamburger Str. Preserved gravestones set against southern wall. Photo: Samuel D. Gruber (2016). Berlin, Germany. Old Jewish Cemetery on Grosse Hamburger Str. 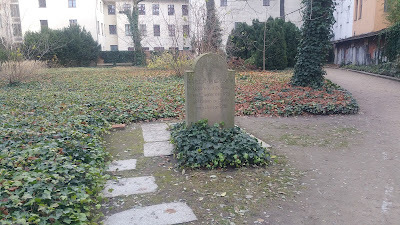 Symbolic gravestone of Moses Mendelssohn. Photo: Samuel D. Gruber 2016. In 1988 the few surviving gravestones which had been set into the wall of an adjacent house (in the pre-war period?) 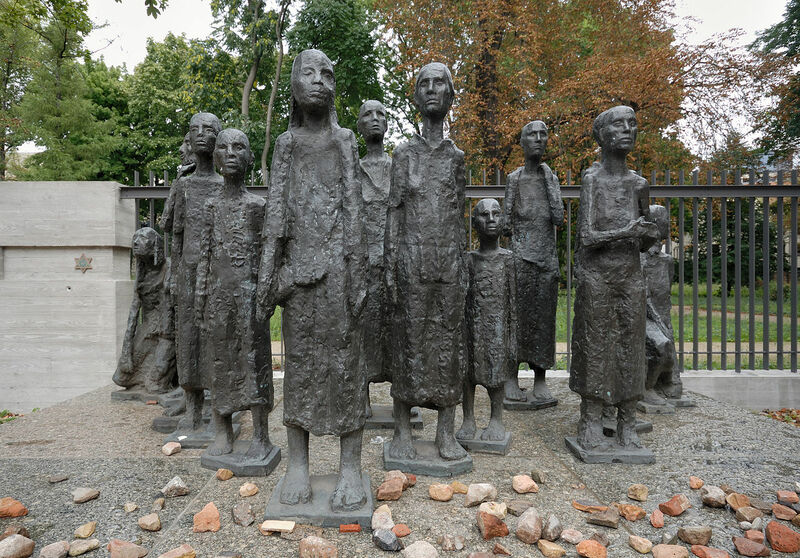 were transferred to the Weissensee cemetery, but these were returned in 2009. 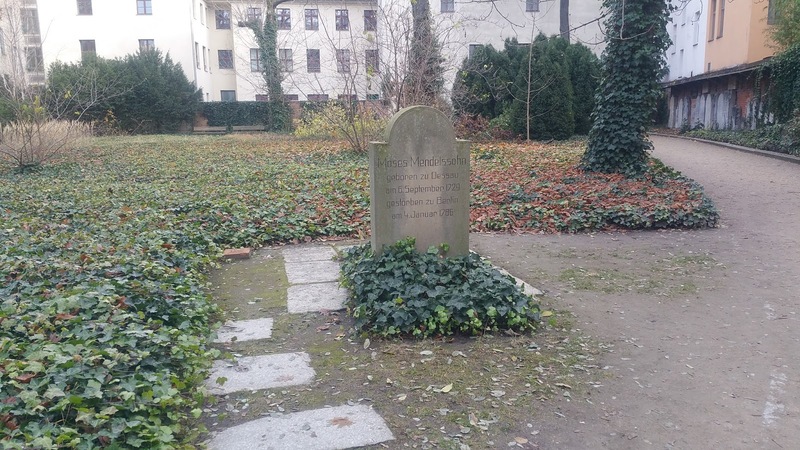 A symbolic grave for Moses Mendelssohn was left at the spot, and even this has new been replaced by a more recent version, similar to the original gravestone of Mendelssohn. The remodeling of the cemetery premises in 2007 was financed by the Berlin Senate and the Jewish community. The area can again be recognized as a cemetery. A ritual washbasin and a prayer board are affixed at the entrance and new signage presents the Jewish history of the site. Berlin, Germany. Old Jewish Cemetery at Grosse Hamburger Strasse. 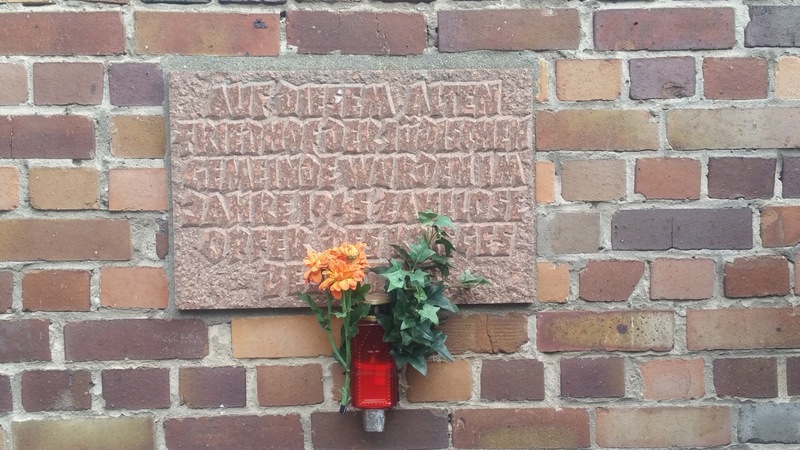 Plaque commemorating mass graves of German war victims. Photo: Samuel D. Gruber 2016. Berlin, Germany. Old Jewish Cemetery at Grosse Hamburger Strasse. Plaque commemorating mass graves of German war victims. The inscripton reads: "Auf diesem Alten Friedhof der judischen Gemeinde wurden im Jahre 1945 Zahllose opfer des Krieges Begraben / "In this Old Cemetery of the Jewish Community, countless victims of the war were buried in 1945." Photo: Samuel D. Gruber 2016. In the 19th century, after the cemetery was closed, the Jewish Old Age home was built adjacent to the cemetery. This building was destroyed by allied bombing in 1945. today, a memorial plaque on the exterior wall of the cemetery commemorates this institution. Berlin, Germany. Grosse Hamburger Str. Sculptural memorial by Will Lammert, installed 1985. Photo: Samuel D. Gruber (2016). In 1985, a bronze sculptural group of figures by Will Lammert (1892-1957) was installed next to this memorial. This is a model for a sculptural group originally intended for installation as part of the Ravensbrück camp memorial, but Lammert died in 1957 before he was able to complete the final project. 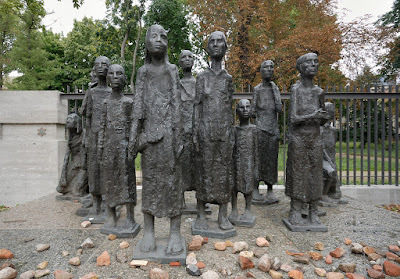 Lammert was a leading German sculptor who because his membership in the Communist party and his Jewish was was exiled from Nazi German, where he was charged with High Treason, and spent much of the 1930s on the run until surviving in Soviet Union. He returned to Communist East Germany in 1951. From 1954 on he dedicated himself to creating the the Ravensbrück camp memorial. The thirteen figures arranged on a base in front of the Berlin cemetery were meant to be part of this work. 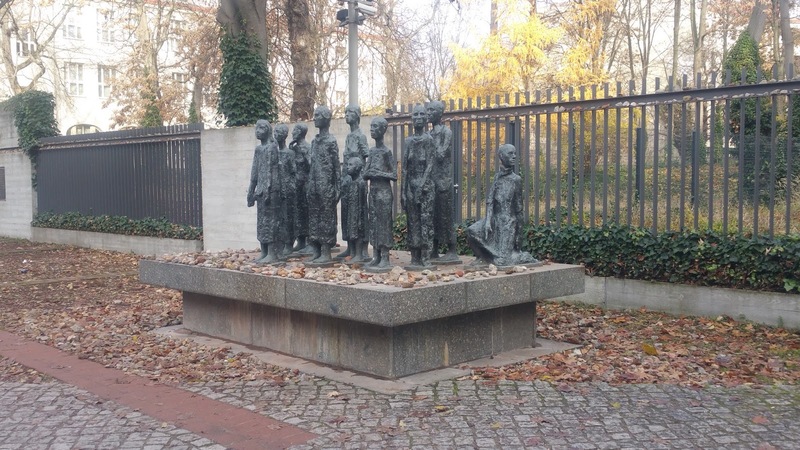 Instead, installed in Berlin in 1985 (in an arrangement by Lammert's son), this became the first monument to the Holocaust created in East Berlin. 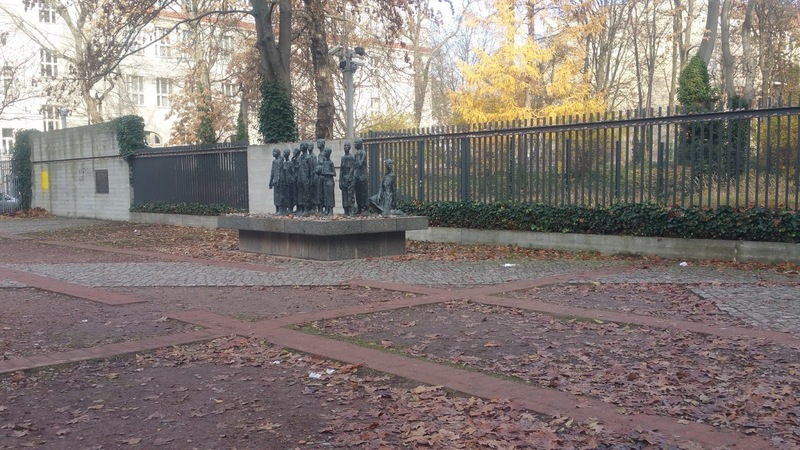 While this might not be the most appropriate memorial for the history of this site, or to commemorate the tens of thousands of murdered Berlin Jews, it has became part of the accepted commemorative landscape. 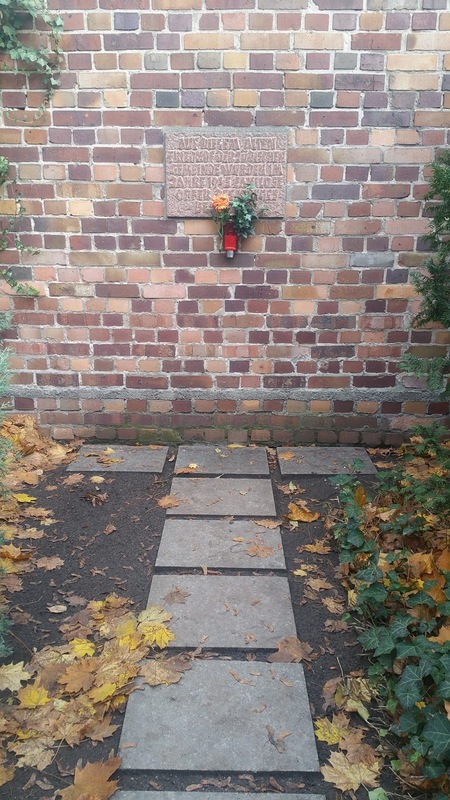 "Grosse Hamburger Strasse Cemetery," website of Jewish Community of Berlin.